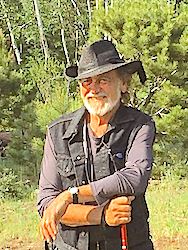 Ron Isaacson: Artist, Sculptor & Arts Educator has exhibited professionally in juried exhibitions & galleries for over 50 yrs. Over the past 25 years he has focused on creating sculptural works that incorporate recycled & repurposed materials. The most recent works from his Colorado Mountain Studio explore the nature and textures of recycled leathers. Unbound Leathers® documents and promotes the art of Ron Isaacson and his philosophy regarding the adaptive reuse and recycling of materials in the designing, creation, selling and distributing artwork made primarily from recycled/repurposed leather garments, furnishings and other found objects. The one-of-a-kind leather pieces are inspired by the textures, shapes, depth and richness of colors in the Colorado mountains. 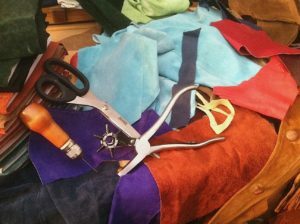 Items are made from recycled hides, leather garments and furnishings using recycled and found objects and low-e adhesives. This work is designed to celebrate the raw organic nature of the materials. Expect pieces to evolve and wear as the leathers respond to daily use, age and environmental conditions. These art pieces can bring you as much pleasure in owning them as the artist received from making them. Pieces pictured may have been already sold. As one-of-a-kind pieces they can not be duplicated. Similar works of equal or greater value, style and form in the “Ceremonial Feathers” series will be shipped when orders are placed. Using recycled leathers and other found objects, these artful creations vary based on the type, colors, textures of leather and other materials available. I do not condone the taking of an animal’s life for commercial use. Yet, like many who believe in animal rights, I see no honor given to the sacrifice made by discarding the hide when it is no longer desired for use in it’s current form. In recycling/repurposing worn, torn, faded and discarded leather I pay homage to that life. 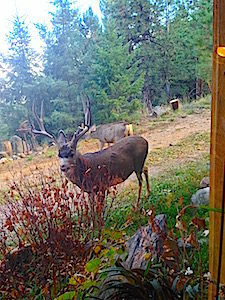 *Proceeds from sales help sustain an artist’s ecological art studio surrounded with Elk, Deer, Fox and other animals in the Colorado mountains.